Well, tonight was pretty epic. 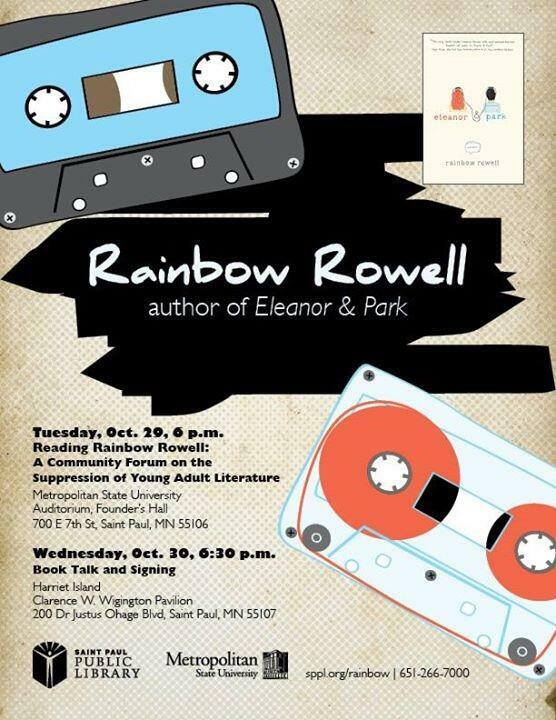 Earlier this year author Rainbow Rowell published a YA novel called Eleanor and Park. It is, in a word, amazing. Beautiful. Real. It’s mostly about falling in love for the first time, but it’s also about bullying, poverty, racism and being safe. One of the characters, Park, is half Korean. His race doesn’t drive the story, but is an important aspect of his character. I told Rainbow Rowell tonight that I wish I was related to Park! In short, it got people talking. It got people interested in the book. It got people reading the book. It got people buying the book. So, um, thank you, censors! (You can find more articles by googling “Rainbow Rowell” “Eleanor and Park” and “Anoka”). And then Metro State contacted me and asked to speak on the Reading Rainbow Rowell: A Community Forum on Kids’ Right to Read on October 29. Tonight! Going back to my first sentence: tonight was pretty epic. The Anoka-Hennepin librarians came, and we applauded them for their good work and bravery. I was able to speak with a couple of them after, and it was such an honor to meet them. So I was on a forum with the author Rainbow Rowell; Julie Blaha, President of the Anoka-Hennepin Education Minnesota; Maureen Gormley, a librarian at Dakota County Library; and Teens Know Best members Kitra Katz and Payton Gerrick. The forum was moderated by Sasha Aslanian of MPR. Sasha had prepared questions for each of us. She asked Rainbow to talk a bit about the book; Julie to talk about what happened in Anoka-Hennepin; the teens to discuss what they thought of the book; Maureen to talk about intellectual freedom and censorship. Everyone did a fantastic job. Sasha asked me questions about the social and emotional development of young adults and what they are looking for in their literature that might be distinct from what adults seek from their literature; about Park being half Korean; about how LIS educators prepare students to deal with censorship. Both adults and young adults are looking for a good story and an escape. But because of where YA are in their development, they’re also looking for a reflection of their own experiences. They need validation, to know that they are not isolated in their experiences, that there are people out there going through the same things they are. Also in Intro, my students are required to read at least one book that has been challenged. This semester I assigned The Hunger Games, The Absolutely True Diary of a Part-Time Indian, and It’s Perfectly Normal. These books have faced numerous challenges over the years. Students have to read one of the books and then be prepared to argue either way for the book. We also discuss the resources that ALA’s Office for Intellectual Freedom provides, such as the Code of Ethics, Strategies and Tips for Dealing with Challenges, Bill of Rights, Interpretation of the Bill of Rights for young people, and the Freedom to Read statement. The next time I teach Intro, I will likely assign only Eleanor & Park and also have students read some of the documents I posted above, plus whatever else comes out by then. Having something like this happen right here in Minnesota – what a fantastic learning experience. Although what happened is very unfortunate, it was a fabulous teaching moment. My LIS 7210 Library Materials for Children students attended the Right to Read Forum, as well as many St. Kate MLIS alum and even some St. Kate undergraduate students enrolled in my Global Search for Justice: Dismantling Racism Through Children’s Literature course! I spoke with most of them after, and they all agreed it was a fantastic event. Involving my students in current events is one of the best ways for them to learn. We also have an advocacy class devoted specifically to helping our future librarians be leaders in the library world and in the world of young people. SLMS students are required to take this class. Moreover, each professor weaves concepts of ethics and leadership into all our classes, and we encourage our students to take on leadership roles, network, be engaged in the community, etc. The audience members then were able to ask questions. They were each handed out cards and asked to write down their questions. Sasha read them to us; they were mostly directed at Rainbow. Some people wanted to know what happens next; why certain things happened they way they did in the novel; whether or not what’s happening here will affect how she writes her next novel, etc. They were great questions. We also continued to discuss intellectual freedom and how librarians and others can fight against censorship attempts. From the tweets (https://twitter.com/search?q=%23EleanorAndPark&src=hash), it appears that most people thought it was a great night. And indeed, it was. It was an honor to be invited to participate in such a wonderful event. 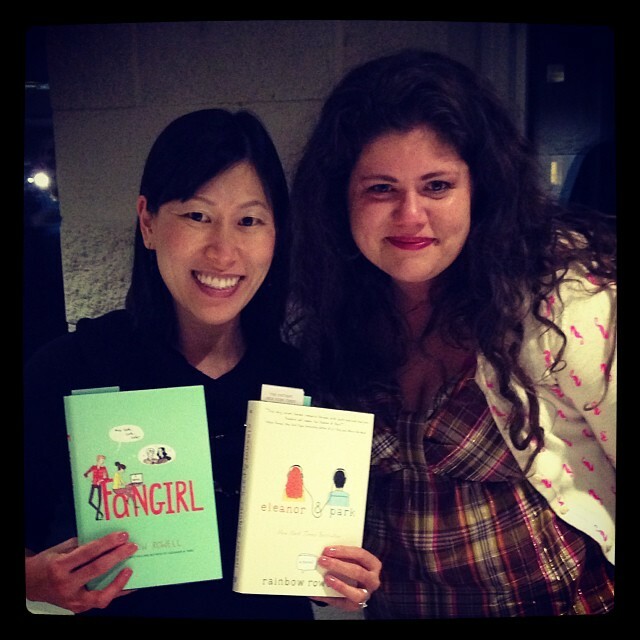 Here’s the last photo from the evening: me with Rainbow Rowell and her awesome books!